Harper Lounge Chair is a great spot to sit back, relax and rotate a little should the mood strike. The support disc, made in high polish stainless steel base, reflects a portion of the body. 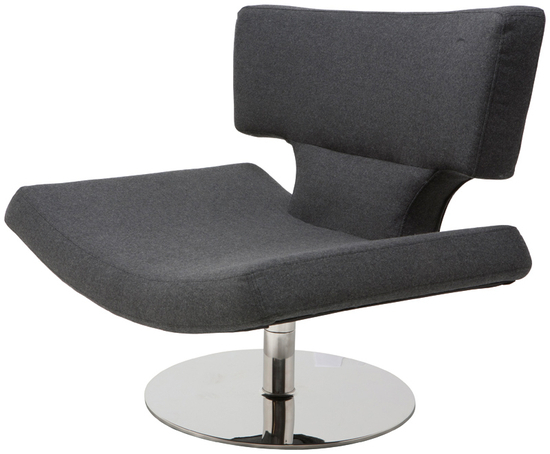 Harper Lounge Chair is a 360 degree swivel chair, marked by great flexibility in use. The soft cushion for the seating make it comfortable and welcoming. Its assertive design adds distinction to any any front porch, offices, living rooms and bedrooms. Seat Height - 14.25", Seat Depth - 20"